The nonclinical and clinical operations are made up of the twin pillars consisting of pharmaceuticals and chemicals. We continue to achieve substantial improvement in our know-how and capabilities in drug development, which enables us to provide comprehensive services for each stage of the drug development process. Our activities in this area are not only limited to pharmaceutical products, but also include the development of novel chemical products and agricultural chemicals. Through these operations we continue to contribute to peoples’ health and to a safe and secure society. 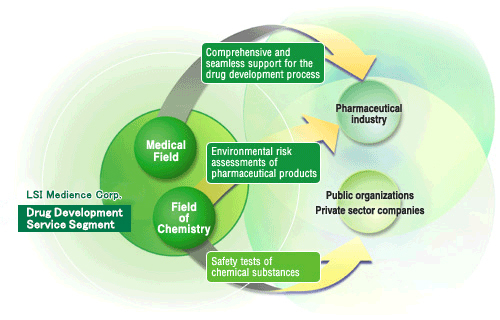 We offer comprehensive support for all aspects and stages of the drug development process. We also provide a number of additional functions and assistance in such areas as exploration capabilities, preclinical studies, clinical studies (Central Laboratory Services and Bioanalysis Service), and post-marketing surveillance. Up until now, the former Mitsubishi Chemical Safety Institute Ltd. has been principally involved in non clinical studies, and LSI Medience’s DrugDevelopment Services Division in clinical studies. Through the integration of these operations, we now offer a vast array of knowledge and technical know-how in these two important and vital areas of expertise, and with that are now able to offer complementary support of each other’s operations. This also allows for uniform service offering a range of options, from the early discovery stage to both nonclinical and clinical study, and further on to post-marketing surveillance. In addition to these services the Drug Development Service Segment is also be offering support services for carrying out personalized medicine-discovery programs that are ensured to improve the efficiency and streamlining of the drug development process. Not only involved in handling pharmaceutical products, we also carry out safety testing of agricultural chemicals, chemical products, and food products (additives and specified health foods). This is in addition to environmental and working environment measurement as well as surveys and analysis of safety-related issues. All of our research and studies are in strict adherence to the laws concerning protection and management of animals in full respect of the standards concerning care and management of test animals, and have been accepted and certified for animal welfare practices.